"Imago Theatre co-founder Carol Triffle is a strong bet as the city’s most idiosyncratic theater maker, with a knack for the way movement can convey character and for imaginatively odd premises that shine a light into the cracks of human experience." Oregon Arts Watch, published yesterday about FALLOUT. 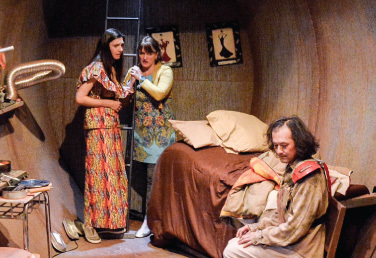 A truckload of word and physical comedy populates Carol Triffle's absurd romp, while long-time Imago comedic talents Danielle Vermette, Anne Sorce and Kyle Delamarter play off each other as well as the Marx Brothers. The comedians maneuver inside an amusement park of a special effects set designed by Triffle. While on a picnic, Jackie Anne and Nadine accidentally discover a fallout shelter and find themselves locked inside with Bobby, Jackie Anne’s one-time romantic cousin. 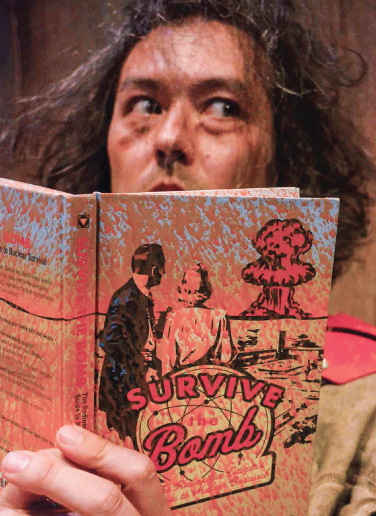 Bobby has hidden away in the shelter with dirt bike survival gear, and portraits of two actresses who died in Hiroshima. Flirtations and light hearted menace spar between the three while the most hilarious encounters, physical comedy, dance and song sprout here in there vaulting the characters into first time kisses with line after line of playful nuance. FALLOUT takes place in the most charming chamber equipped with all we need to sustain this absurd apocalypse as an impending (can we even say palatable?) doom approaches. Like a word magician and sleight of hand director Triffle guides her audience to a place where the end of world is almost acceptable as apple pie.